Albert Park in Melbourne couldn't have been a better venue to open the new era of Formula One with no driver aids. And with another Grand Prix just a week later - and at a radically different venue - the first two rounds of the 2008 world championships not only highlighted the differences between the two leading teams, but served to show just how tight the mid field will be this year. As the cars are now devoid of traction control, braking stability aids, and corner-by-corner differential control, drivers struggled with the bumpy and slippery track in Australia. Melbourne is all about big changes in speed and direction, lots of heavy braking into tight sequences of turns. This lower speed character challenged the cars and their drivers to maintain control. Their problems were exacerbated by the track conditions - Australia has recently seen an unprecedented dry spell - which, along with the high temperatures, reduced grip on the temporary track. Friday's practice sessions saw the cars racing around with plumes of dust being lifted from the track, and thereafter the track was continually littered with dirt and debris from those spinning off in the corners. Equally, the hot weather challenged the new cars. Although the winter test schedule was punishing, the teams never tested in fully hot conditions (aside from the Ferrari/Toyota test in Bahrain). The Australian heat tested brakes and the internal packaging of the cars, so gearboxes failed, engines ran hot, and reliability took a dive. Malaysia brought yet more hot weather, and the Sepang track - now in its tenth year on the GP calendar - has started to see more bumps. The heat, allied to the punishing straights, also tested reliability, but in terms of race reliability far more cars finished the Malaysian race than the Australian one. Appearing with the set-up seen at the last tests of the winter, Ferrari's unchanged car was expected to be at the very front of the field. However, the team's Australian GP weekend started badly and deteriorated all the way through to the last laps of the race. Friday was punctuated by spins - the Ferrari f2008, particularly in the hands of Kimi Raikkonen, appeared to want to run wide under braking, letting wheel on to the dusty kerbs and spinning the car. This scenario was similar to Raikkonen's Monza crash last year and was repeated in the race. Along with Felipe Massa's first corner exit spin and Raikkonen's outbraking manoeuvre, the Ferrari appears to struggle with stability in certain circumstances. The car was at least as quick as the McLaren and clearly quicker than the rest of the field, but in traffic the car couldn't overtake. Perhaps the stability lost from electronics has not yet been recovered from the mechanical and aerodynamic set-up of the chassis. On a clear lap, the car was able to reach its potential, but the car's willingness to snap oversteer under braking is something that may hinder the Ferrari drivers in overtaking at other races. Moving to Malaysia, Ferrari's pace was transformed and the Italians were clearly quicker throughout the weekend. Even so, the car still exhibited some instability in the race, as Massa spun out on lap 31. Entering the first tighter right-hander, the Brazilian hit the kerb heavily before the apex. As he continued towards the next corner, the car oversteered and spun Massa out on to the gravel. It would seem as though the car was unsettled by the kerb, which upset both the car's balance and downforce. By lifting the car off the track, the kerb robbed the floor of rear downforce, just as Massa needed the grip to accelerate through to the next corner. As with last year, the Ferrari car doesn't like the kerbs, and as in Melbourne the week before, it appears to be sensitive to excessive inputs from the driver. This will hamper the team as the season progresses and suggests that not all the lessons from 2007 have been learnt. BMW's car did not carry the front wheel fairing seen in testing. The lack of the fairings gave clear sight of the front wheel design. Although teams use different wheel manufacturers, the design of the wheels is fairly standard, with the titanium wheels mounting to the hub via H section spokes. BMW Sauber's launch car sported large spokes to the rear wheel; these now appear to be replicated at the front. It is suggested that the wheels use a hollow spoke rather than the H section. Certainly if not hollow, the large cross section of the spokes would make the wheel unduly heavy. As the wheels are unsprung weight, any weight loss will aid the suspension, but any loss in stiffness would hinder it. Both BMW Sauber and OZ Racing (the wheel supplier) would not comment on the wheel's design, further reinforcing the fact that the wheel showcases some form of innovative manufacturing process to make the spoke hollow. Appearing without the revised bridge wing seen in testing, the Renault R28 was very much the same car as the one seen in the last preseason testing sessions. Over the last two GP weekends, several details have become apparent on the innovative car, including ballast mounting and the gearbox stiffening. 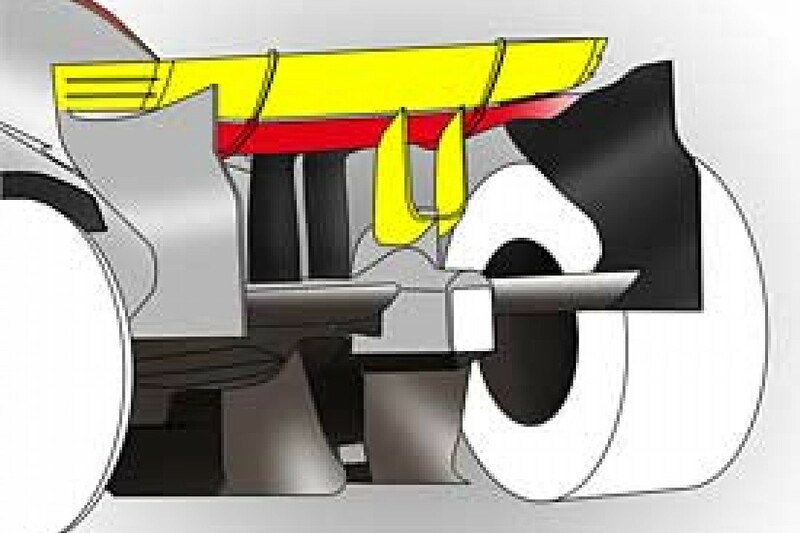 The unusual front wing layout has already been accepted by the team's technical director Bob Bell as a heavy solution, but the near horizontal wing supports need to be heavier, with the same level of stiffness from a vertical support pylon. This weight can be accepted, as the car's weight bias needed to move forwards. Yet the team appear to be using the wing to add more ballast, and a detachable panel in the top face of the main plane suggests the team can tune weight bias by adding material to the front wing - often Tungsten or a heavy alloy known as Densamet. Some teams place up to 9kg in the front wing. This maximises the forward weight shift. 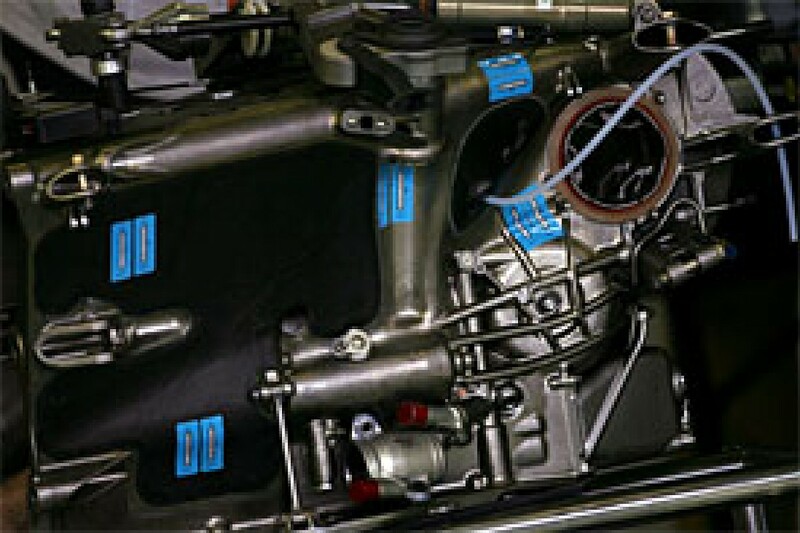 Renault used to run a split gearbox with a titanium gear case bolted to a carbon bell housing. This feature was drooped around 2003 for a full titanium gear case. Like with some other teams, small areas were reinforced with carbon fibre bonded to the metal. This has been used in recent gear cases, particularly with reinforcement between the suspension rockers. This year, the team have gone further with a large carbon fibre panel being bonded to the sides of the case. This would stiffen the case without having to resort to new tooling for the casting. Thus, it is an efficient way to strengthen the case. The main new development for Williams in the first two rounds was a new front wing. Taking its cues from BMW's front wing of last year, the two-element wing is effectively made into a three-element wing in the deeper middle section. By making a slot in the flap, the spoon section can be made more aggressive without stalling. Both RB4s sported small new details around what is already a unique diffuser. Red Bull have followed the high expansion route with their diffuser, making the centre tunnel work harder by making it as large as possible, aided by supplementary channels above the height-restricted (125m) side channels. But the team have gone further by making the side channels almost a separate device from the supplementary and centre channels. This increases the volume of the centre of the diffuser to create the maximum downforce. To aid the flow out of the diffuser, Red Bull have added a small aerofoil section to the rear brake ducts and small lips to the side of the crash structure. These elements help keep the flow attached through the diffuser - although Red Bull have stopped short of adding the larger vertical vanes to the rear brake ducts, as teams with similar diffuser have done. For Malaysia - and partly as a result of the incident between David Coulthard and Massa - Red Bull moved their mirrors inboard. The team have continually endeavoured to keep the mirrors in the aerodynamically beneficial outboard location. But the driver's comments have seen the mirrors returned to L-shaped brackets attached to the tub. Red Bull also found themselves before the race stewards at the Malaysian GP due to an unusual failure in the front suspension. In Friday's first practice session, Coulthard appeared to run wide approaching Turn 13. Skipping over the first kerb, he hit the second part of the kerb with more violence as he rejoined the track and wrecked his front suspension. The initial problem with the car was pinned to the track rod, which connects the steering rack to the upright failed. This is evidenced by the right hand front wheel kicking outwards before the Scot understeered off the track. This failure was found to be an adhesive failure between the carbon arm and the metal end fitting. Teams rigorously check the entire manufacturing process of the suspension components - including x-ray and rig tests on the finished components - before fitting these parts on to the car. If the glue itself failed due to a preparation error, then the x-ray or ultrasound testing would not pick up the problem. But somehow the rig testing did not see the component fail, even though the rig tests tend to be at greater loads than the drivers experience on the track. The subsequent total suspension failure was brought about by the car impacting the kerbs, the front wing coming back into the suspension, and the force of the wheels rising up over the kerb. All these left the front suspension in pieces. Wishbone and pushrods are fragile items, any damage to the carbon fibre soon sees the component catastrophically fail - even stone chips have been known to fail wishbones. The impact of the front wing would have been enough to start the failure, while the load placed through the wishbones and pushrods by the wheels hitting the kerb only aided the process. With such a small suspension travel of just 25mm on the front suspension, hitting a large kerb with both wheels would exceed the loadings that the suspension can handle. Although cars often see one wheel hitting a kerb without damage, the set-up of the front suspension is actually softer for a single wheel than for both. This is due to the third spring, which only comes into effect when both wheel travel upwards. At a high speed track such as Sepang, the third springs will be set up to limit droop to ensure the floor remains at the ideal attitude. If both wheels hit a kerb then the third spring could effectively lock up the front suspension. So it seems the Malaysian incident was a case of several circumstances conspiring against the team. Honda's Melbourne update was previously run at the team's private test at Jerez. As a result, few details emerged of the new specification until the car arrived in Australia. The complex rear wing wasn't raced, but the angled shelf wing ahead of the rear wheels was retained. Towards the front, the bargeboards have been updated. 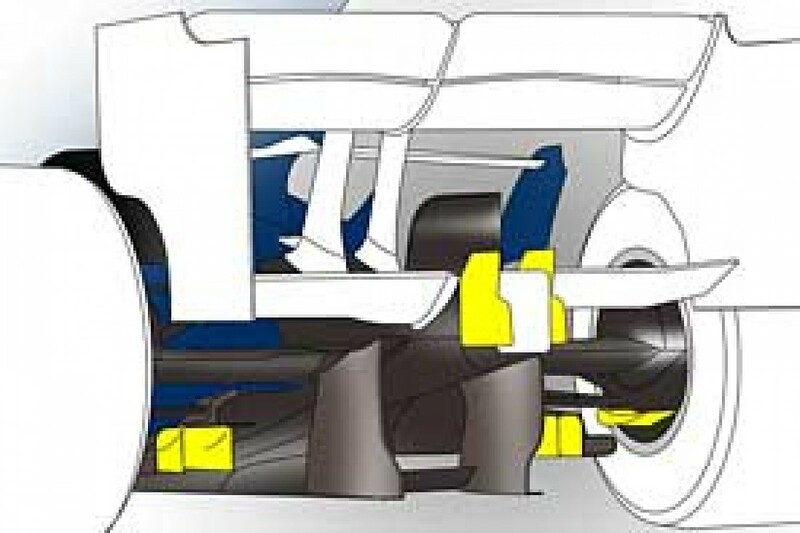 As with the larger rear boards, the smaller turning vanes in amongst the front suspension have had stepped edges added. As yet no other team have added this feature to the front boards, the serrations break up the vortex formed along the top edge of the board. With a conventional smooth edge, one large spiral spills off the vane, and with these little steps, the vortex is broken into equally smaller flows. Having missed the last preseason tests and not formally released their new car prior to the season start, The SA08a made its debut in Australia. As yet little confirmation has come from the team regarding the car's design and development. It's clear that the car is very much the result of Honda R&D's ownership of the intellectual property that led to the Honda Racing RA107. And, as with last year, Super Aguri have a car based on the design of the previous year's factory car, via Honda R&D in Tochigi. However, unlike last year, the car sports almost identical details to the late season version of the RA107. 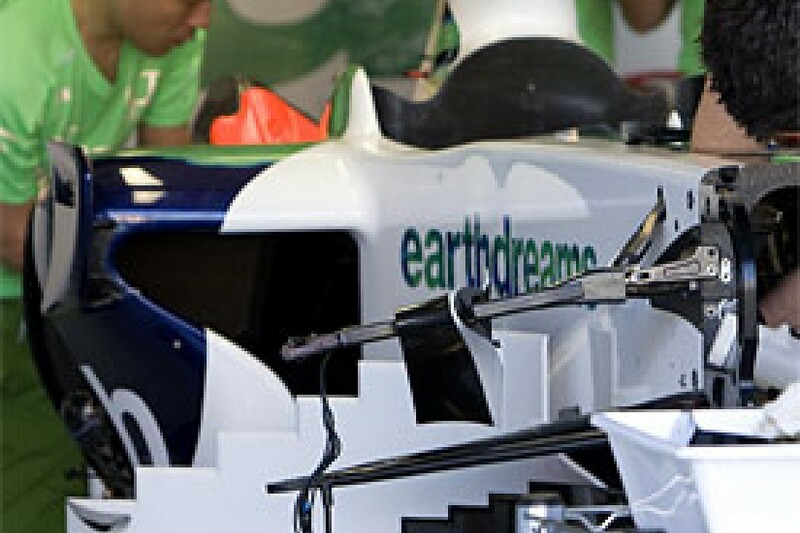 Whereas Super Aguri are still able to independently develop the car, their financial issues in 2007 prevented the team from developing the SA07 car and this appears to have continued with the lack of evident development to the SA08. The car does differ from its predecessor, largely as a result of the revised rules and with one major aero change. The car has an engine, gearbox and electronics from Honda R&D. These are likely to be identical to the RA108 that Honda Racing are campaigning this year. But the rear-end and diffuser bear some differences to both the RA107 and RA108. Firstly, the diffuser uses a differing gurney set-up, although it does copy Honda Racing's flaps above the side channels. Then, the driveshaft fairing features two small gurney flaps, which broadly line up with the outer part of the diffuser that is not aided by the aforementioned flaps. Lastly, the beam wing differs from Honda's as it is split either side of the rear crash structure -unlike Honda's, which tends to have a full width beam wing. Clearly some of Super Aguri's independence is retained, and the recent financial security should allow the creative design team to put more work into the car to improve its pace. Despite the late arrival of the new car, the team have added several updates to the VJM01 for Melbourne. Clearest of all these changes were the new mirrors and front wing endplates. 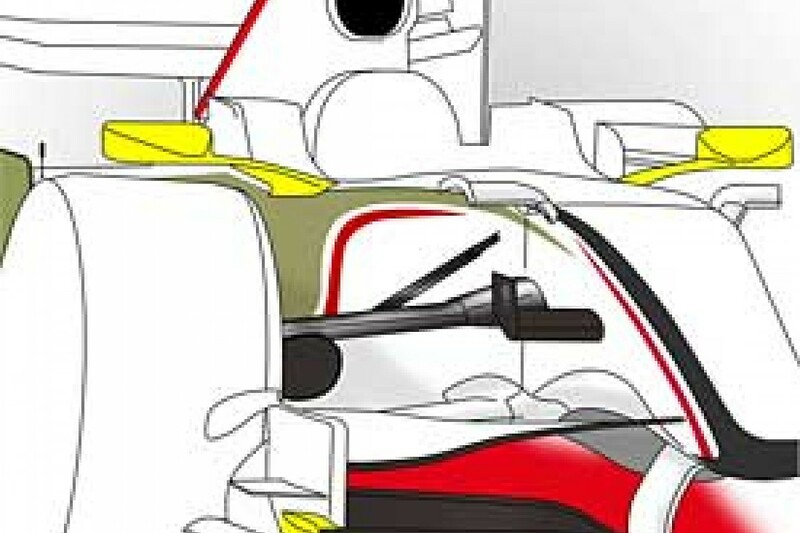 The mirrors' new shapely mountings reflect Super Aguri's 2007 designs that integrated a fin to control flow around the cockpit; while the endplates' stepped leading edge reflects Renault's preferred endplate solution. Speaking to autosport.com, technical director James Key pointed out the smaller changes: "We had some subtle changes on the large lower wishbone shroud, which were difficult to spot, and some forward barge board modifications in the foot plate area". The team have previously stated that the car had the downforce but not the efficiency. Again Key was able to clarify where the team are at present: "There is never enough downforce! "We can achieve reasonable downforce levels at present with the car, however we knew from 2006 and 2007 that aero efficiency was an issue in that we have had too much underlying drag. As a result we have paid close attention to our efficiency levels during the development for the 07 B-spec and 08 cars and have controlled to tighter targets, the gains for 2008 have been efficient ones and our speed trap performance is now improved." Key also added that the announced mechanical changes were on the car. "On the front we have changed the motion ratios of the spring/damper elements with new rockers, which has helped pick up some mechanical grip at the front of the car and improved braking stability - which we found to be badly affected by the loss of control systems. "In addition, there have been some small geometry tweaks at the back of the car to aid longitudinal performance (braking/traction), which was run in winter testing and has stayed on the car." Emerging as Victors in the first race, McLaren's chassis showed composure and reliability not found by the team's rivals. Fastest throughout the weekend, the MP4-23 appeared to have less off-track excursions, while the race was only blighted by the speed limiter button being knocked by Heikki Kovalainen late in the race. This is a toggle type switch recessed into the left upper portion of the steering wheel. McLaren have changed their steering wheel more than other teams over the winter, already having the McLaren display unit (part of the SECU package) integrated into the dash. But now McLaren have announced a change to the button to prevent a repeat of Kovalainen's error. In Malaysia, poise shown in Melbourne was lost to oversteer. The MP4-23 is clearly less comfortable in the faster corners with the tail sliding when pushed. For both races the car sported one visible revision to the testing car, in that the rear wing gained a new winglet. Forming a U shape under the rear wing, the new device sits within the 15cm allowable area behind the wheels. The pointed endplates sit inline with the normal wing support struts and their upper edges follow the curve of the wing. The U wing probably helps the flow passing under the centre of the wing to remain attached, as it is more likely to separate from the wing as the flow is impeded by the roll hoop and engine cover. Thus, the rear wing can be steeper for more downforce without stalling.